You can see a time-lapse video of this painting being created HERE. Enjoy! And have a great holiday. "Self Portrait Sketch no. 2"
I've explained it before - I always paint self portraits from photo reference. I took a slew of selfies the other day, and have been trying out a few different heads - hoping to complete a large self portrait (head and hands) before the end of the year. It's a tall order. Good thing I'm a short person! Any other painters want to give it a shot? "Self Portrait Sketch no. 1"
I just finished up a Christmas portrait commission, which, because it hasn't been gifted yet, is unsharable. What to do with all that leftover paint? You got it: Selfies! This kind takes a little bit longer than this kind, but it's a lot more fun. Here's my sketch-to-finish. 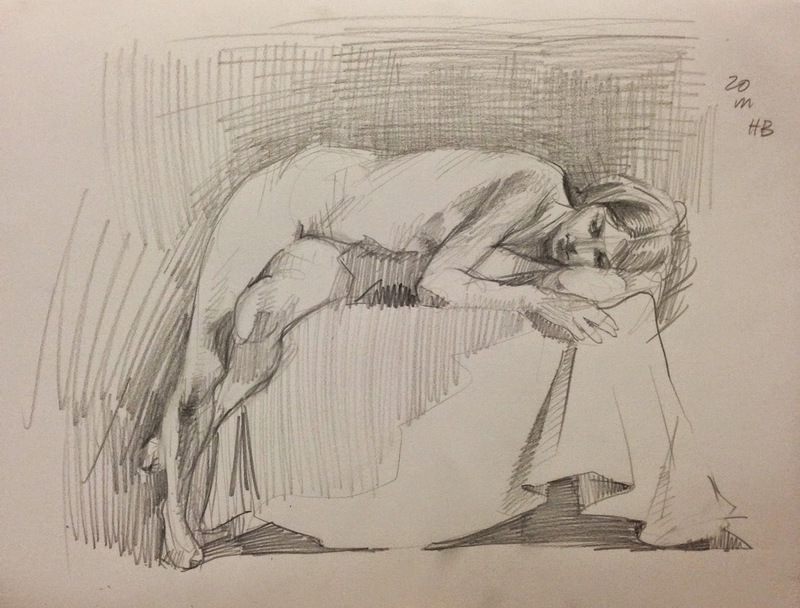 The pencil drawing was a quick ten-minute warmup in my studio journal. 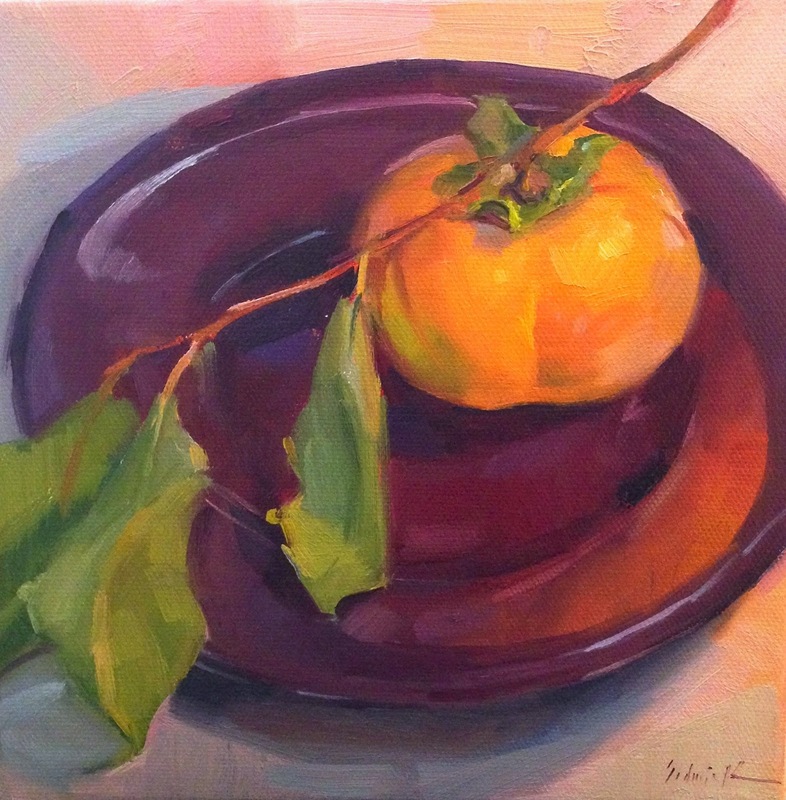 For this piece, I used a palette of Cadmium Red, Viridian, Hansa Yellow, and Yellow Ocher. I think of that either as a straight up complementary Red-Green setup, with yellow thrown in because you can't do flesh tones without it - or as a three-primaries palette, with red, yellow, and Viridian green as a stand-in for blue. Cadmium Red and Viridian mix some beautiful pinks and lavenders, which I might never have fully explored if I hadn't tried this palette combo. 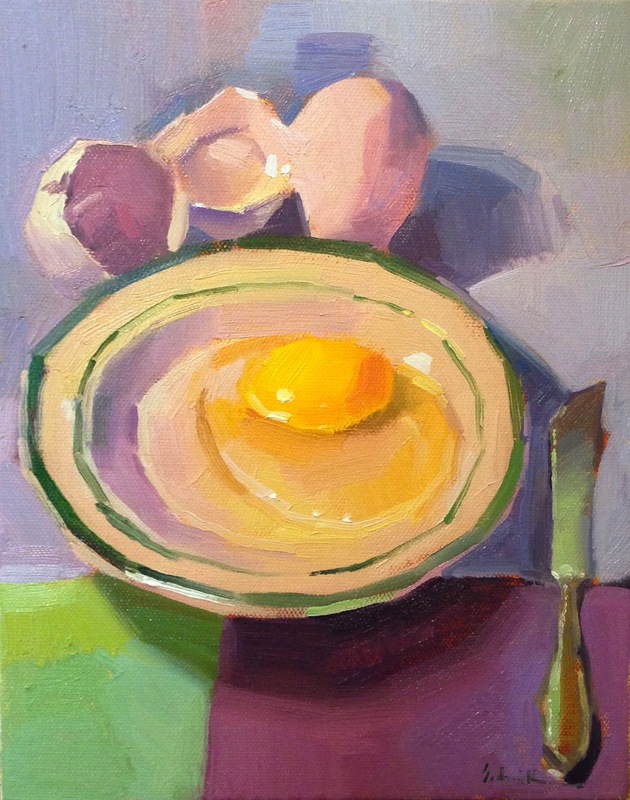 There are so many reasons to try painting with a limited palette...but my number one favorite? It saves me from having to track down all 11 or 12 of my normal colors when I'm rushing out the door on Tuesday nights! I kept the background thin and brushy to let some of those sepia tones peek through. 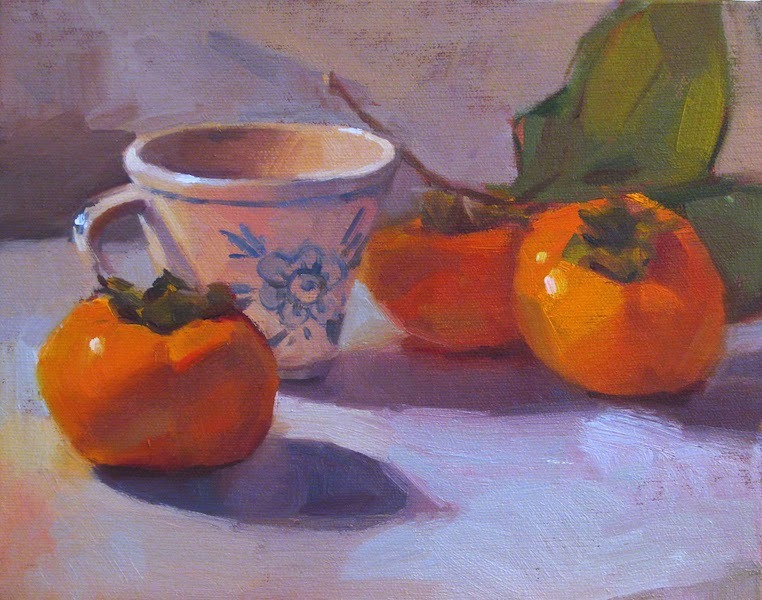 I painted these persimmon pieces at a fun event called the "Tools of the Trade Show," put on by the University of Oregon's college bookstore (known as "The Duck Store," because, you know, football). It's a mega-meet-n-greet with art supply vendors, and the store invites artists to create in the middle of the mayhem. I had a great time. Trying not to get distracted by all the radically reduced art supplies. 25% off the entire store! but I shouldn't be so hard on myself! 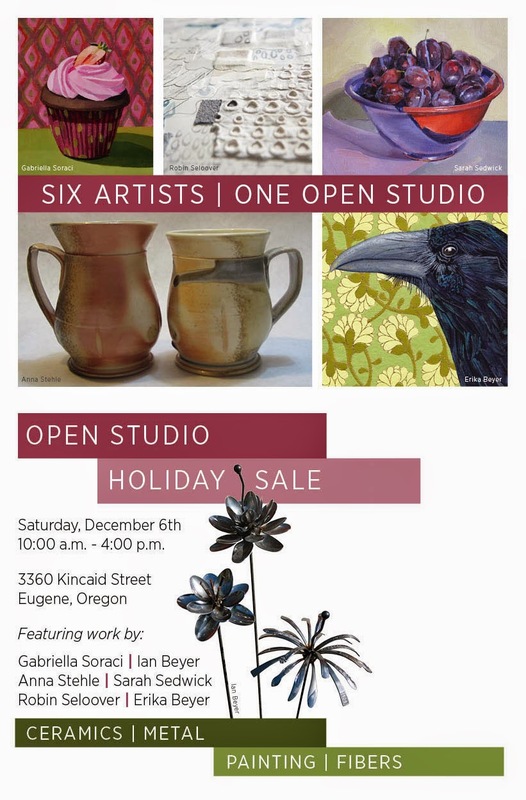 In fact, I've been busy plotting and planning.... First, a holiday open studio and sale, next weekend, December 6th. It's going to be at my best friend Gabriella's gorgeous studio (if you don't want to catch Studio Envy, consider staying away). We have a diverse group of artists, with ceramics, prints, paintings, handmade books, and even garden art. Snacks, drinks, deals, discounts (hint: on my table, there will be a $20 and under box). You should come. Here are the details. 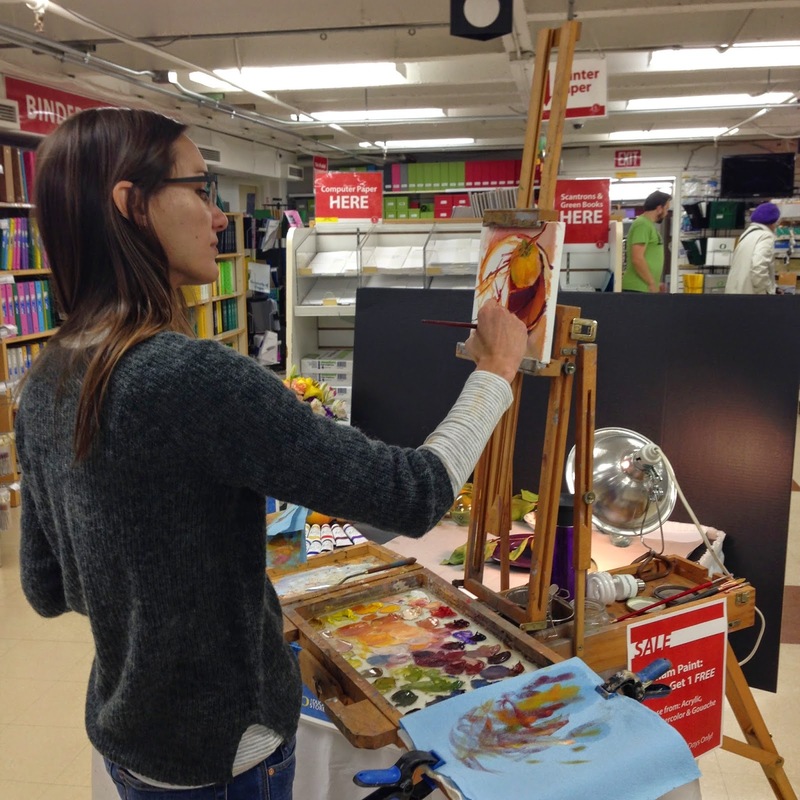 I've also created - and updated - a new section of this blog: Workshops! 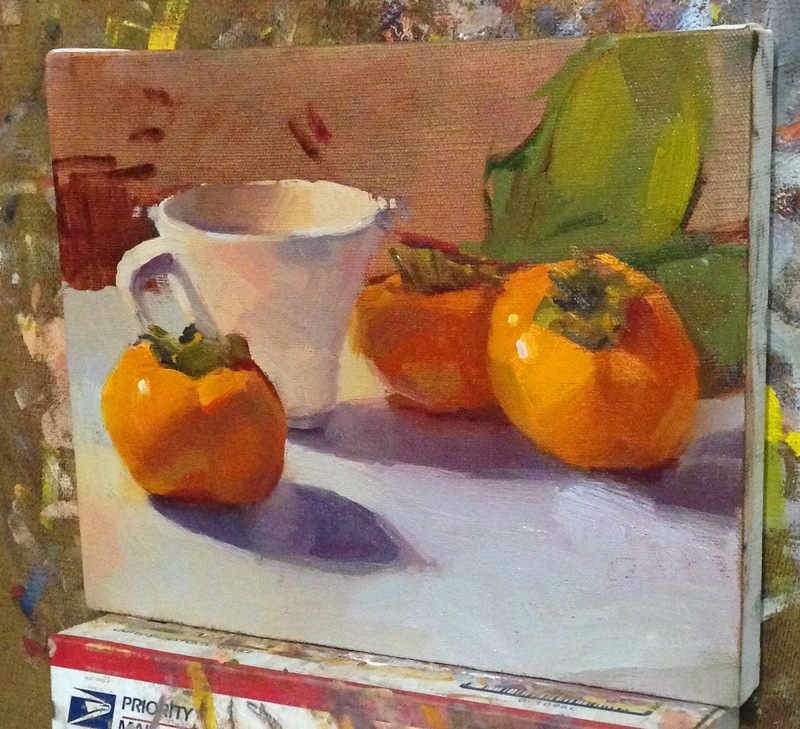 Click the workshop tab at the top of the page, or (if you're reading this in your email - and I don't blame ya) just click here to see a list of my upcoming workshops and painting demonstrations. Putting the 'Work' in Workshop! I had a great three-day weekend, but I wasn't relaxing! 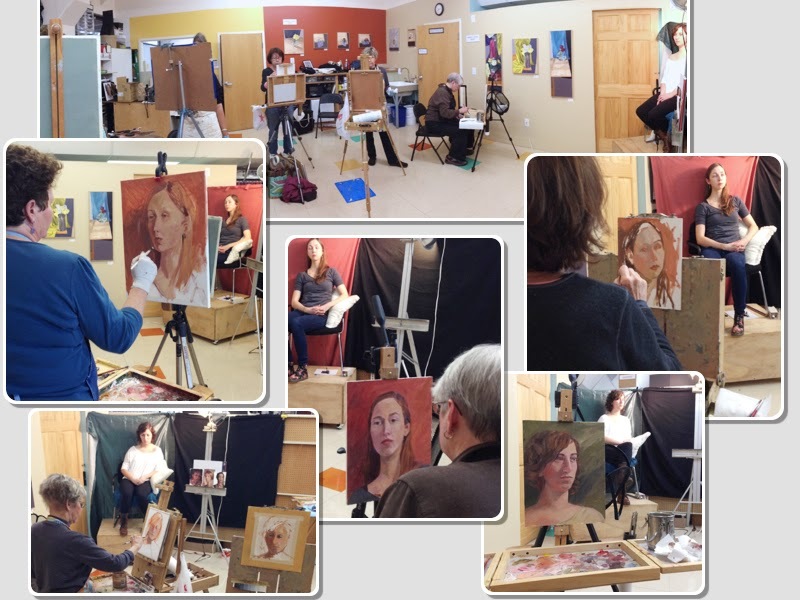 Neither were the five intrepid students in my Zorn Palette Portrait workshop at Oregon Art Supply. 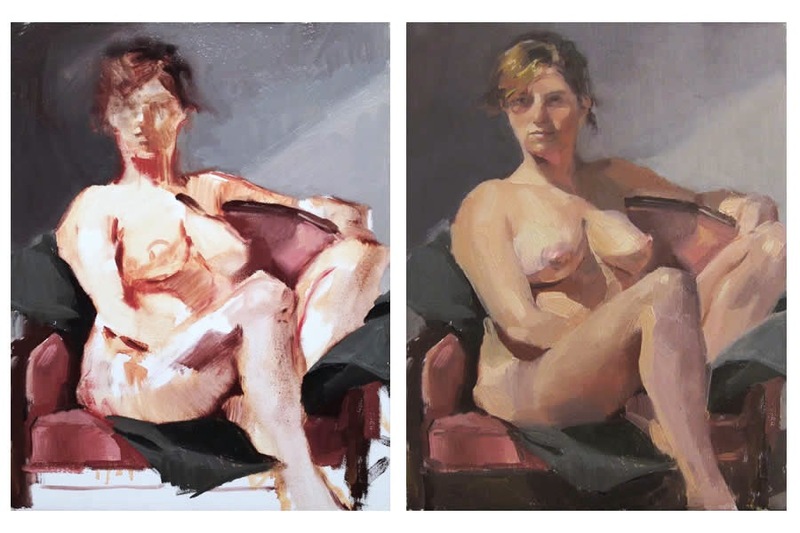 We painted from a different live model every day, doing 30 minute sketches, 1 hour studies, and 3+ hour paintings too. I can't say enough about the effort - and the improvement - these ladies showed. 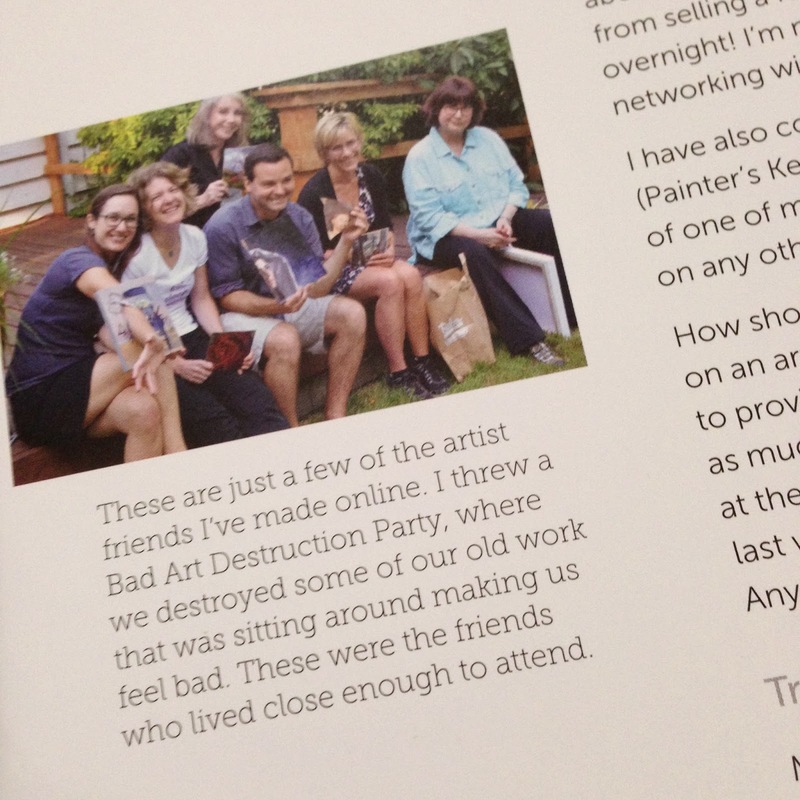 Check them (and their incredible paintings) out! Below are my demos from the weekend. The center image was a 30-minute sketch, and the ones on either side took about two hours each. 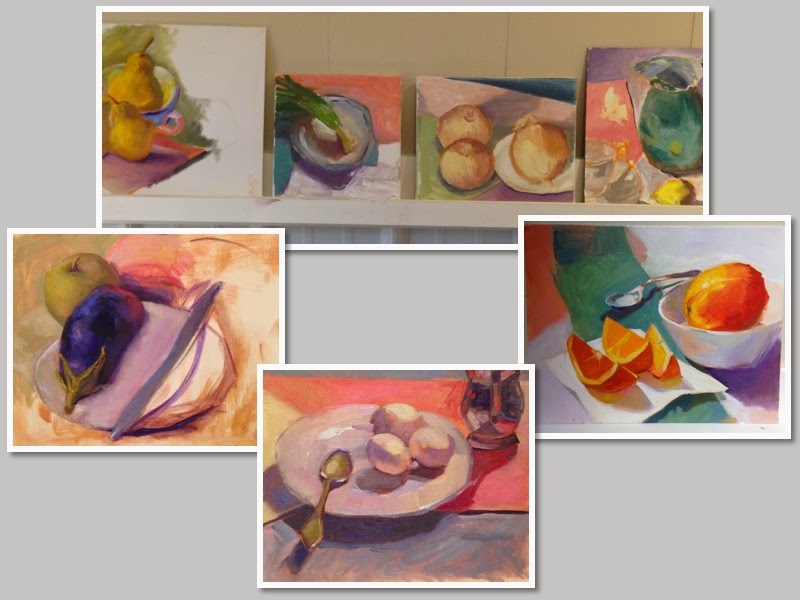 One of my favorite things about teaching is how inspired I feel after a workshop - inspired to paint, inspired to teach more - exhausted and energized at the same time. The next session of Zorn Palette Portrait will be January 10-12th, 2015. Click the Workshop tab above for more info! Here is my figure painting from Tuesday night - my first time painting this lovely model. She'll also be modelling for my Zorn Palette Portrait workshop, which begins tomorrow. I know the students will love her calm, serious face as much as I did. 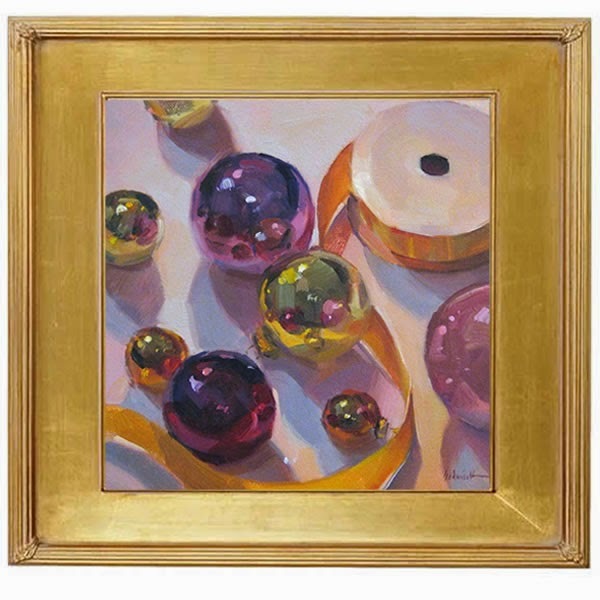 This will be my second time teaching Zorn Palette at Oregon Art Supply. (Here's my post about September's session.) 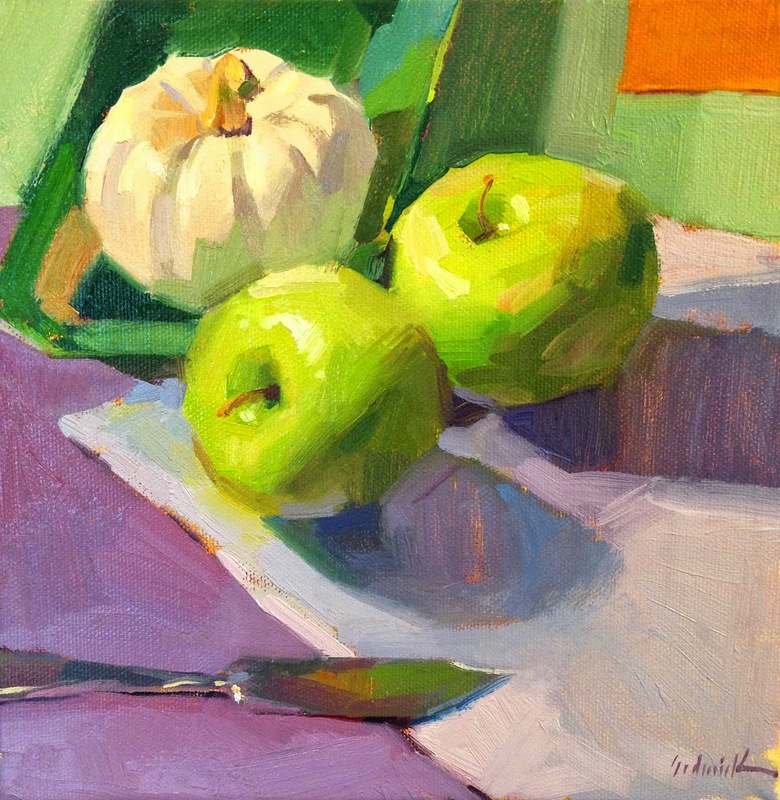 I'm hoping to do it again in January, and the workshop is limited to five students - so if you think you'd like to join me, call today to reserve a spot! 541-683-2787. This piece ends my week of coastal still lives. I loved immersing myself in the natural light of the beautiful studio I rented in Toledo. It's so incredible to take yourself out of your natural habitat once in a while. Well, I thought it would be a no-brainer. Oregon coast...fishing boats everywhere....I should paint some fish, right?! Turns out, it's harder to procure a whole fish, on the coast, than I thought. Since I didn't arrive prepared to catch my own, there wasn't much available that wasn't filleted. I did have an interesting encounter with an enormous tuna in a walk-in freezer on highway 101 just south of Newport, but I balked at buying - mostly because that fish was large. Damn large. I hate to tell you this, but I bought this sad little guy at Safeway. He's a Tilapia. He gets his name from a favorite childrens book of mine, Louis the Fish. 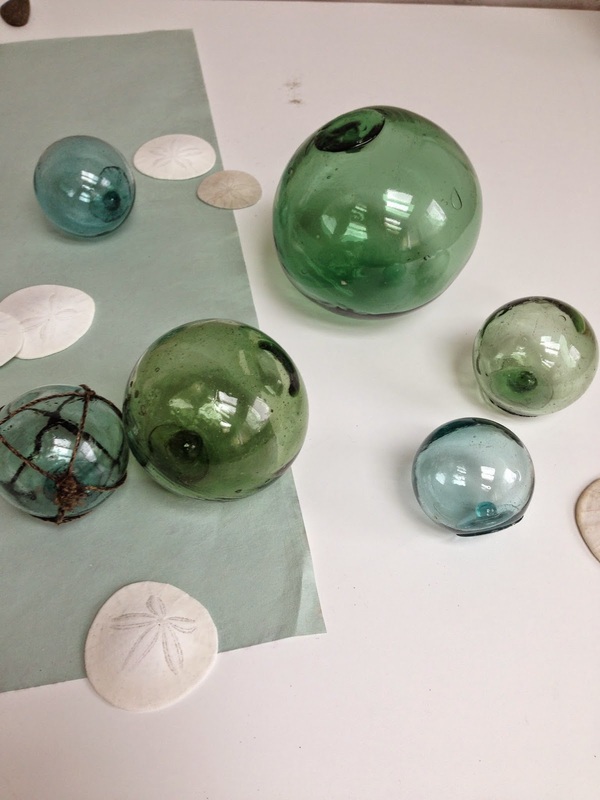 These glass floats are an Oregon coast antique shop staple. 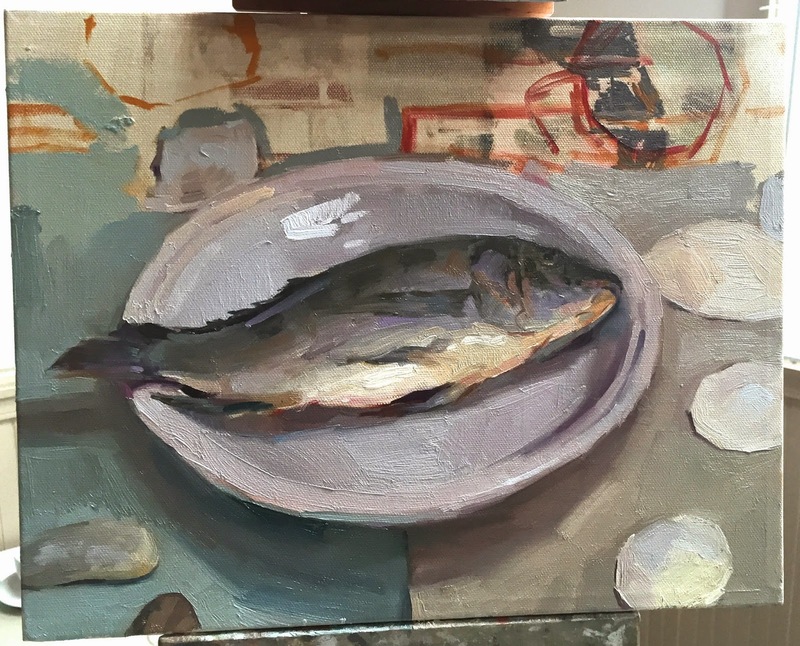 I didn't head to my Toledo residency with these in mind to paint - in fact, I thought I'd be painting fish all week - but that was not in the cards, as I'll tell you much more about tomorrow. Here's how this painting developed. 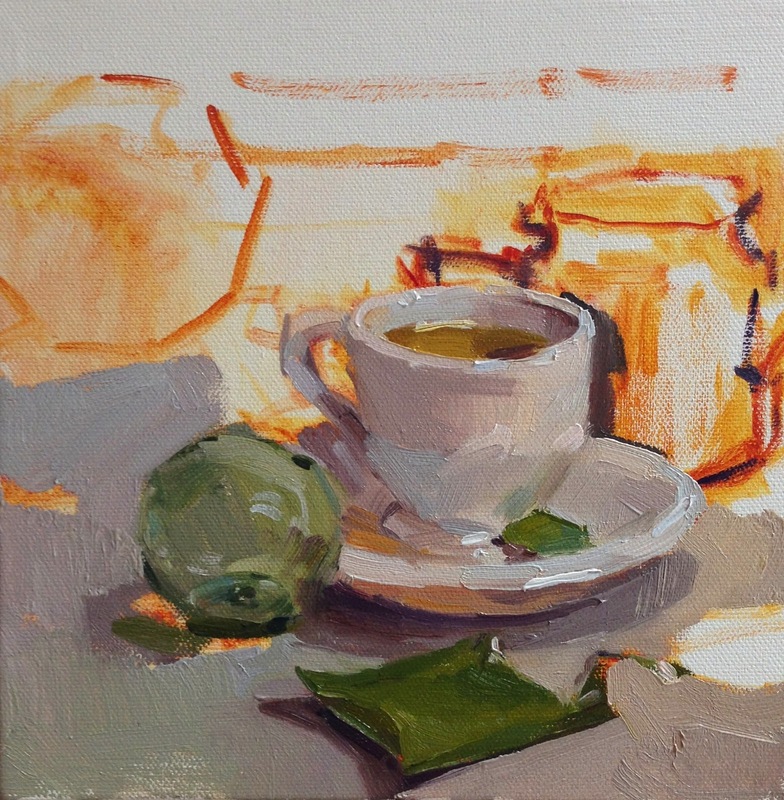 I sketched in the underpainting with a mix of Cadmium yellow and red, dulled with a tiny bit of Ultramarine blue. I like the warmth peeking through, even though the dominant colors of the piece are cool coastal blues and greens. I'm posting a series of still lives this week, painted on the Oregon coast in the amazing studio owned by Michael Gibbons. Click on the home tab above and scroll down to see more of them! Another Coast Still Life, and Excitement in the Mail! Conveying various textures is something I talk about a lot in my workshops. 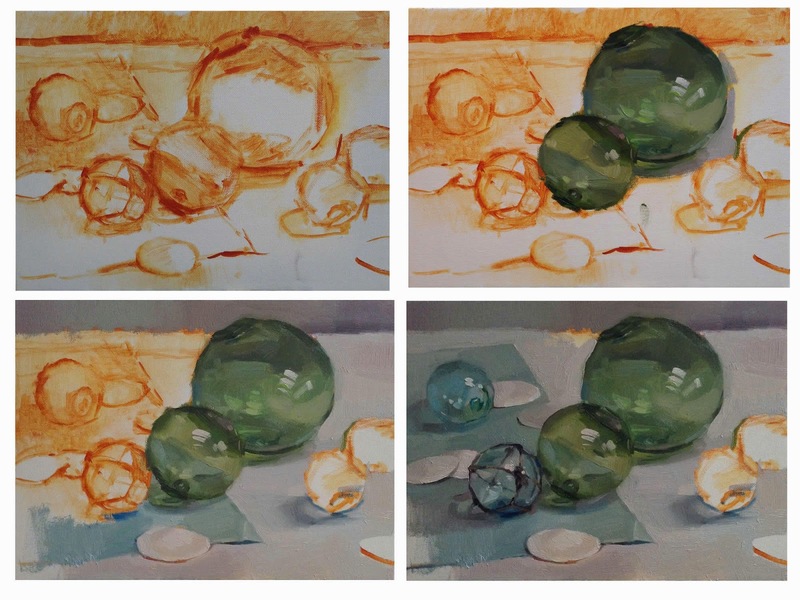 The trick to differentiating a rough rock from a smooth blown-glass ball is all in the transitions between values, which sounds ridiculously simple, but it isn't. Really, it's all about observing. The transition from a highlight to a midtone is what shows our eyes whether they're looking at a piece of velvet or a shiny metal pot. Is it a smooth, gradual transition, or a sharp juxtaposition of bright light next to dark? Speaking of painting tips....I just cracked open a very exciting envelope from Random House: my friend Carol Marine's new book! 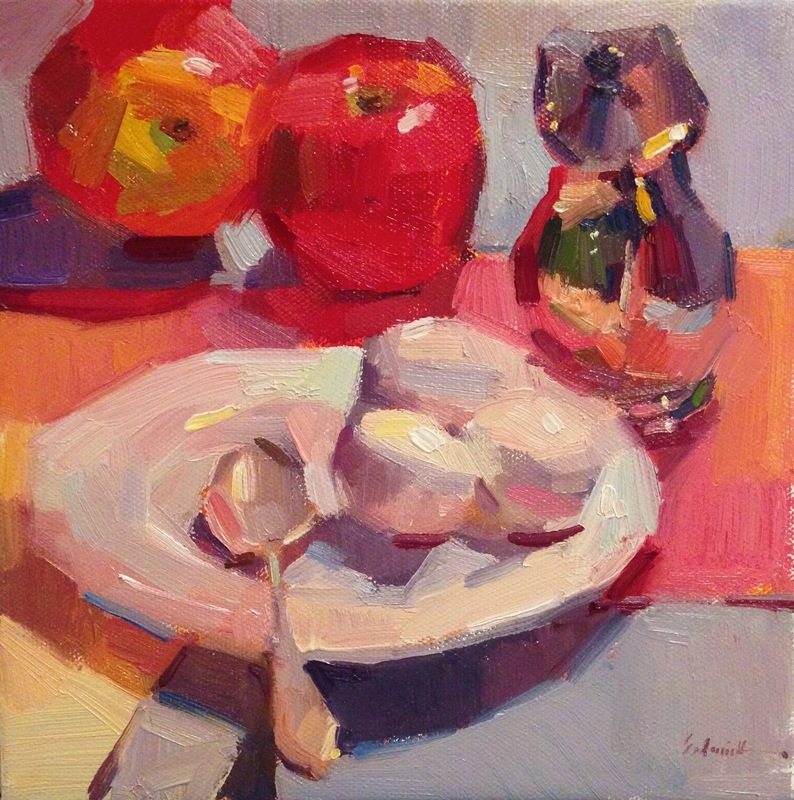 Plus, she included one of my paintings as an example of using perspective in a still life. What an honor! 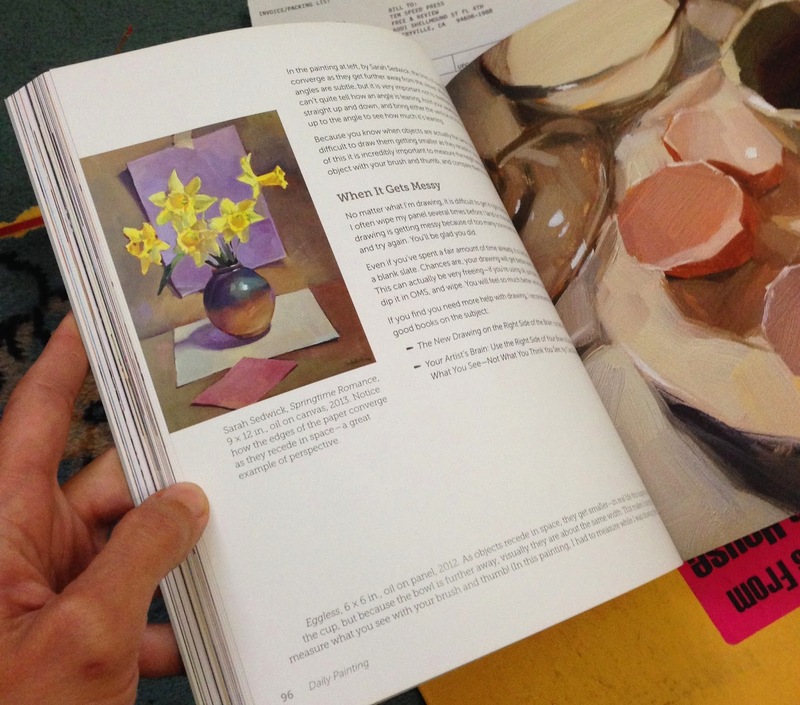 Really, if you paint, or know someone who does, this book is a must-own. Go buy it! I went to Toledo last week planning to paint still life, but I decided to take nothing with me. No props. Ok, yes, I took some of my favorite backdrop papers, but I wanted to paint whatever came my way. There was nothing at the studio, though! It was a blank canvas. Luckily, there's a bustling antique and beach-mobilia industry at the coast, and I was able to get my hands on some beautiful, simple stuff. Sand Dollars and floats. I rented a studio in Toledo, Oregon, and painted up a storm. It was a perfect little place: a renovated, historic building from the 1880's, which used to house the Justice of the Peace for this tiny coastal town. It's owned by Michael Gibbons, an artist who paints amazing Northwest landscapes. 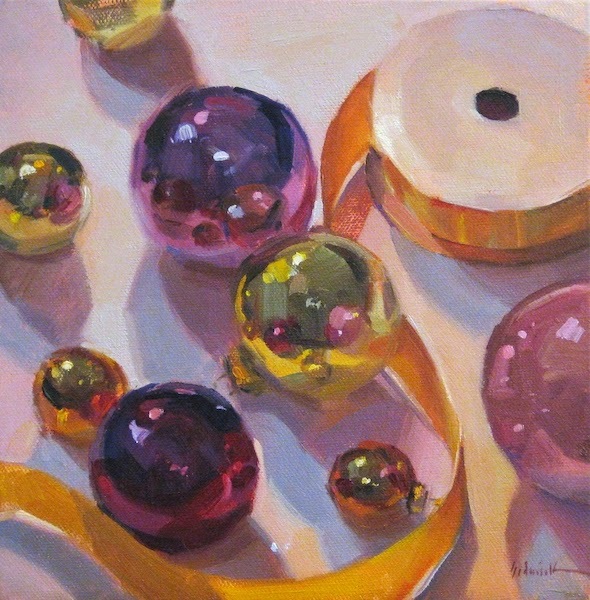 The light in the studio is sublime, and I think you'll see the evidence in all my work from the week! Skylights, north-facing windows, peace and quiet. Lack of wifi kept me from blogging, but really, isn't an enforced internet break what we all need sometimes? The weather was typical Oregon coast October: windy, windier, rainy, and chilly. 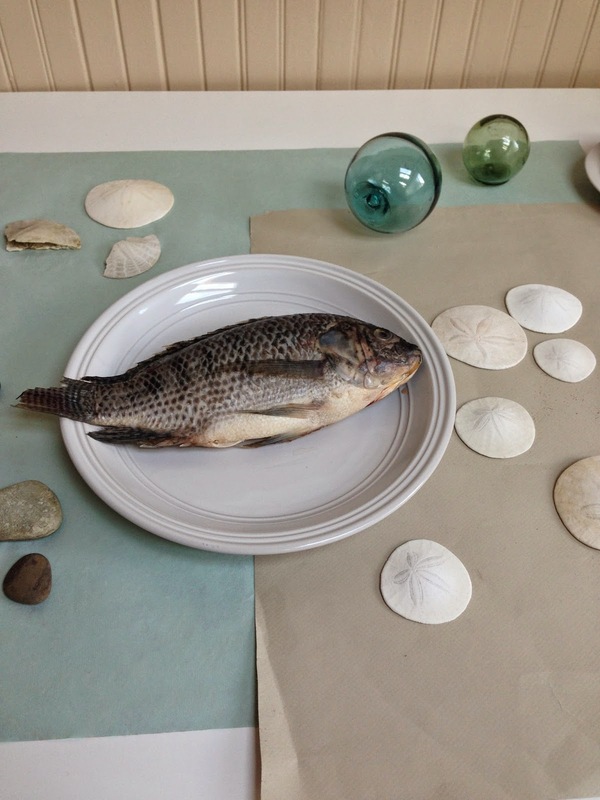 I was perfectly satisfied to stay inside and focus on still life, painting my beach-walk finds and some antique store treasures. Stay tuned for much much more! "Demo at Shreveport no. 1"
Wow, what a weekend! And, yes, I do know it's Thursday and already almost another weekend. I'm talking about last weekend, which I spent in Louisiana teaching! It's taken me this long to get this blog post together - I had loads of great photos to go through, and yes, a wee bit of flying trouble which delayed me a day getting home. Shreveport is beautiful, just look at this! The workshop was hosted by one of the students, whose lakefront property and amazing studio were perfect for the class - and more than luxurious for me. I'm so grateful to have gotten to spend time painting there! 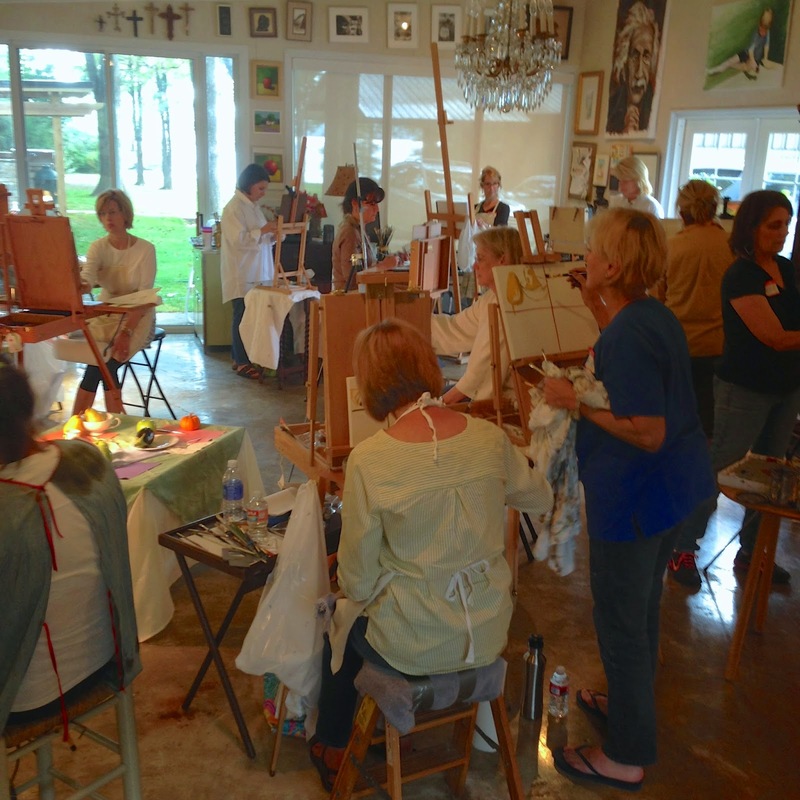 They were a talented - and motivated - group, who came well-prepared to do some serious painting. In fact, I got so jealous watching them paint that I had to do a little painting of my own after class on Saturday night - the teacher's homework! "Demo at Shreveport no. 2"
For our final day of class, I broke some eggs. They make a good change of pace after two days of fruit. Here's my demo, which I painted after lunch, you know, just in case anyone was tired. Were they tired? I couldn't tell! They were the most enthusiastic cheerleaders ever. "Demo at Shreveport no. 3"
Thanks so much, ladies, for a great workshop!